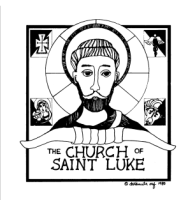 I have been a member of the Church of St. Luke since 1993. Since joining the parish, I have participated in a number of ministries and activities including Eucharistic Minister, member of the Parish Council, Knights of Columbus and teaching second year Confirmation candidates on morals and morality. After many years of discernment and prayer, and with the encouragement of my wife Debbie and Fr. Ron among others, I entered into formation for the permanent diaconate in 2009 and was ordained in June, 2013. I grew up in Albuquerque, New Mexico, and being a “cradle” Catholic, attended Catholic schools all the way through high school. I have been married to my wonderful wife, Debbie, our K – 5 Faith Formation Coordinator, for more than 41 years. We have two sons and are blessed with two beautiful grandchildren. I am a graduate of the U. S. Naval Academy where I received a degree in Mechanical Engineering. I am currently employed by The Boeing Company as Director of Business Development. Among my responsibilities as deacon at St. Luke are visiting and ministering to the homebound and leading the RCIA program where we bring new members into the Catholic faith. My experiences as a deacon since my ordination have far exceeded my expectations and have been a source of great joy for me. I have very much enjoyed getting to know all the wonderful members of our parish. 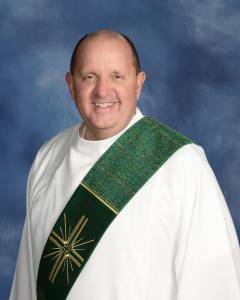 It is an honor and great blessing to be a deacon at the Church of St. Luke.